It’s all about location of this spectacular home with 270 degree views of the Intracoastal Waterway, Shallotte Inlet and Atlantic Ocean. 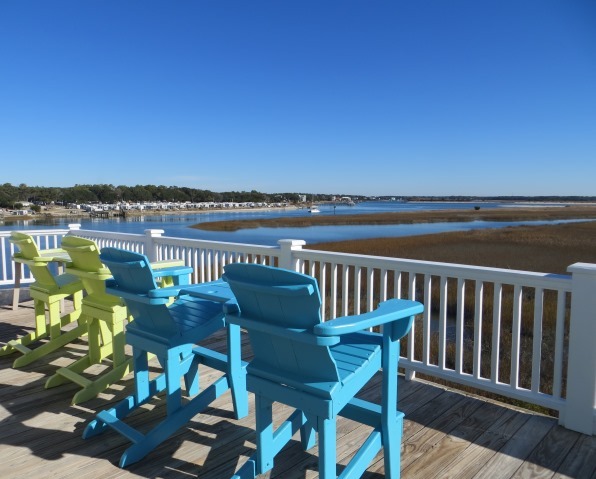 Decks from every door of the house wrap around so you can take in some of the most spectacular sights on Ocean Isle! This 4 bedroom 4 full bath custom built home is located on the east end of the island in the Maritime Place community that is surrounded by the natural beauty of the island. 14 Baywatch (14BAY) is a unique home that offers 2 individual living areas. Each level has 2 bedrooms, a full kitchen, a spacious living room and dining area. You will also find a washer and dryer on each level, too! Both levels have access to a large deck providing spectacular water views. The two levels are accessed by an interior stairwell as well as an elevator. On the top floor, take advantage of an oversized master suite with king bed. The master's large bathroom includes walk in shower, Jacuzzi tub, and double vanity. A second bedroom has a queen bed and completely renovated full bathroom with shower. A twin sleeper sofa is available for extra sleeping. A large kitchen opens up to a spacious living and dining area. On the lower level, the master has a king bed and a shared bathroom. The second bedroom has a single and double bed. This bedroom can use the adjacent master bath or the full hall bath right across from it. There is a queen sleeper sofa in the family room. A full size kitchen and eat in area along with an expansive living area make a perfect place for two families to vacation together yet maintain their own sense of privacy. Baywatch has something for everyone! Each bedroom has its own television and both living rooms have large screen TVs and DVD players. Wireless Internet. Board games and puzzles are available. On ground level there is a ping pong table and a foosball game that can be lighted for night games as well. Relax in a hammock on each level. Maritime Place community amenities include a community tidal dock for small boats and a community pool just across the cul-de-sac from the house. There is also a fishing pier close by and it is an easy 6 minute walk to the beach on a well maintained path. Renter will have use of community boat dock for loading and unloading passengers during high tide only. Boats can be launched from the public access at the OIB bridge. Boats with trailer can be parked on the rental property. Overnight docking at the floating dock is not permissible. A fixed dock is available for overnight docking, but depth of slip is not guaranteed. The first floor (lower level) of this property can be rented in the Value or Off Seasons as a two bedroom only! Sleeps 5. If we dont stay oceanfront, we will stay here. Its wonderful if you like the quieter side of the island. Fishing, bird watching is great, every window has a beautiful view.